I pulled about 5lbs of beans out of the garden yesterday, and then I topped them, and saute'd them, and put 1/2 in th fridge and 1/2 in this wonderful yellow chicken curry. I also grabbed a few baby yellow squash and added those as well. The chicken was cooked with TONS of fresh ginger (not grown by me... lol) and lime juice. 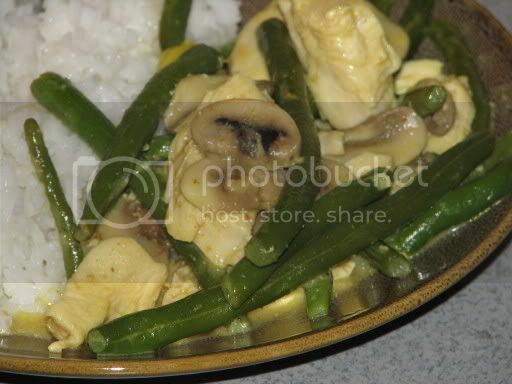 The yellow curry was a sauce mix Don likes from Trader Joe's and a can of coconut milk along with more ginger and lime. Everything else was just saute'd in coconut oil (very healthy) and a bit of grapeseed to bring the flash rate up so the beans didn't scorch. You can't see the squash at all in this picture, but it is there... tiny little yellow squash that wern't overcooked to my suprise so it made the dish VERY beautiful. It was a truly yummy meal over perfectly cooked Jasmine rice.